You can get Celebi by downloading Pokemon Bank before September 2014. Pokemon Bank, the cloud service that lets you store a large amount of Pokemon online, and its companion app, Pokemon Transporter, which lets you transfer Pokemon from Black, White, Black 2 and White 2 to X and Y, will launch on December 27 in the US. To celebrate, Nintendo has announced that its launch will also accompany the game's first legendary Pokemon distribution event: Celebi. As long as you download the app prior to September 2014, a free Celebi will be automatically be placed in your bank. You can then transfer it to your game by launching the Pokemon Link feature from the game menu. The special event Celebi will have the moves Hold Back, Recover, Heal Bell and Safeguard. Hold Back is a move that cannot be learned during normal gameplay. It is similar to False Swipe, where it will always leave the target PokÃ©mon with no less than 1 HP. 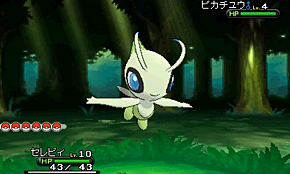 The Celebi will be level 10 and have the Ability Natural Cure. The Pokemon Bank service requires a yearly subscription of $5, and allows you to store up to allows you to 3,000 Pokemon. If this seems a little bit rich to you, and you just want to utilize the service to bring over your Gen V Pokemon, don't fret, the service (including the Pokemon Transporter) will have a free trial period, from when it launches until January 31.